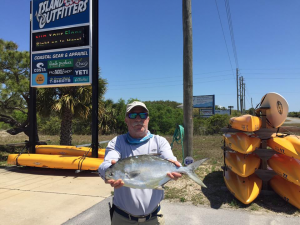 On the beach: Pompano still plentiful! Seems like a surprising amount of pompano are being caught this year – I’m thinking the bite might last through the summer. Most pomps being caught on Fishbites and our double rigs. This year we added a flourocarbon rig with double 2/0 nickle circle hooks, flourocarbon as you know is invisible in water. For casting pompano jigs, Doc’s Goofy Jigs and Nekid ball Jigs are your go to. Nice trout being caught all up and down the beach, any suspending or sinking twitchbait is highly effective, an of course Fishbites will also produce. 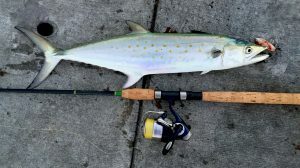 Spanish Mackerel are on fire. Cast a silver spoon or Gotcha plug. If you are in a boat off the beach – I like to troll X-mas tree rigs terminated with a spoon and a quarter ounce keel weight. Always look for the birds feeding on the surface and there’s sure to be mackerel. In the bay: Trout, redfish, tripletail being landed regularly. Topwater plugs for trout and redfish early in the morning during the feed period is my favorite technique – using a twitch, twitch and a pause when retrieving. Later on in the day switch to a suspension plug – same retrieval method. Don’t forget your spoons as well. Your plastics fished with or without a popping cork. A plastic and popping cork combination is a great way to locate trout – depth and area. Tripletail are here and should remain so all summer. 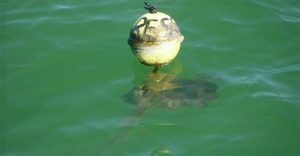 Check underneath all floats and structure on the surface as they like to shade themselves from the heat of the midday sun. The DOA Shrimp is a great artificial bait properly casted.